The war on drill rages on. Some of its most popular videos have disappeared from YouTube, and 1011, a prominent rap group, is now banned from making music with any mention of death or injury, and must inform police about all upcoming videos and shows. The Metropolitan Police began taking aim at the genre and its musicians for encouraging London’s spike in knife crime and gang violence. The crackdown has been criticised as censorship of a genre that’s hyper-local and DIY. In June, the police gained a court order that effectively bans drill music being made without their permission. However, even if YouTube has deemed the genre as too explicit or dangerous, it’s not too explicit for Pornhub, where some drill videos are being uploaded. The Times recently wrote an exposé claiming that DJ and presenter Tim Westwood’s broadcasting of drill artists meant he was profiting from gang violence. 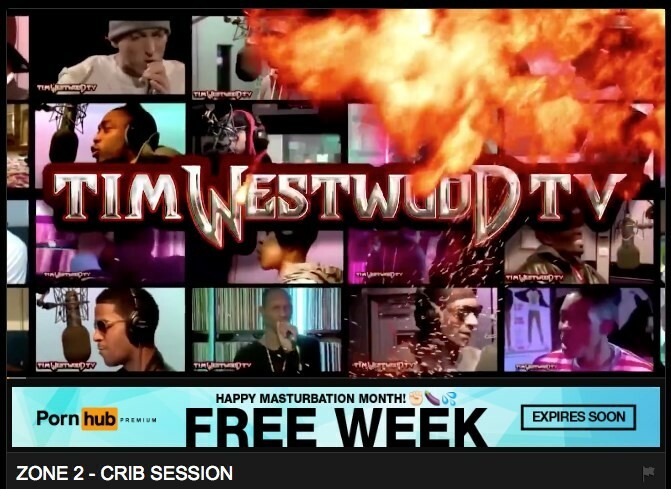 But “your boy Westwood” is also turning up on Pornhub. His Crib Sessions with BSIDE, 1011, and Zone have appeared on the adult film site, after being pulled down from YouTube, alongside a host of 1011’s music videos which made their way onto the site over the weekend. This isn’t the first time that Pornhub has dipped its toe into music – or piracy. In 2014, the site decided to create its own record label. Then in the middle of the streaming wars that saw Tidal seize the exclusive for Kanye’s (last actually good) album The Life of Pablo, fans were able to stream his album for free on Pornhub – if they were willing to ignore all the penetrative ads that adorn the page, that is. Of course, banning videos from YouTube probably won’t kill the genre, but it does show a vital misunderstanding of gang violence and poverty in the capital. Gaika, our political editor-at-large, recently wrote about drill and the community around it, detailing it as the product of a looted world – fraught with institutional racism and prejudice – that wasn’t designed with black men in mind. “It’s true, young people are killing and dying on our streets for nothing, but sensationalised reportage and kneejerk responses do nothing,” he writes, criticising the moral panic and hyseria surrounding it. Hear what else other young people said they believe would actually help instead.